Talent-investments can be integrated into all types of grants. Your foundation, or your grantmaking portfolio, has likely defined your grants according to certain functional types of grant support. Commonly used categories are program grants (project or restricted grants); general support (core support, general-operating, or unrestricted); and capacity-building grants (organizational effectiveness grants). While there are other types (planning, capital, etc. ), this supplemental guide will focus on these grant types. The grantmaking practice we refer to as “talent-investing” is the intentional deployment of resources to support and develop professionals and leaders in the nonprofit sector workforce. This practice traditionally falls under the umbrella of capacity-building grants. This is far from adequate. Nonprofit programs, general operations, and capacity, all rely on nonprofit professionals and volunteers. And while nonprofit people are the bedrock of organizational capacity, they do not belong to their organizations like laptops, databases, accounting software, or intellectual property. People ebb and flow across organizations, bringing their skills and perspectives with them. So, it is counter-productive to relegate support for talent to a bullet point in a long list of capacity-building activities. Many diverse nonprofit professionals will benefit from these types of investments. Below are some brief guiding ideas on how talentinvestment practices can be integrated into program, general support, and capacity-building grants. Often the funding community talks about and funds nonprofits programs in a disembodied manner – as if organizational robots magically produce services for communities without the involvement of human beings. So, let us begin by making explicit what ought to be a commonly understood fact. Nonprofit People Are Nonprofit Programs. While businesses produce shoes, soft drinks, car parts, toilets, and other commodities that have an exchange value, nonprofits exist to offer services that are rooted in substantial human value and simply do not belong in the for-profit marketplace. We would all agree that the social services of the social sector cannot and should not be made or delivered by machines. The work done by foundation grantees is fundamentally a human endeavor. The value of your grantees’ programs depends entirely on the people who lead and staff those organizations. For this reason alone (without making mention the needs of those nonprofit professionals themselves), it is in your interest as a grantmaker to invest in programs and simultaneously in the staff who run the programs. Any program grant can include an investment in the grantee’s staff development. The objective of a talent-investment should support the programmatic objectives of the grant, and primarily support the staff members who are relevant to that program. But optimally, the talent-investment should feed into or help underwrite the overall people-systems of the grantee organization. For example, you may fund specific professional development opportunities for the staff working on an afterschool enrichment program at a local youth center. In the process, you can help ensure there are adequate professional development resources in the youth center’s overall budget (not just the program’s budget) and that these funds are accessible and used by the staff. When making a program-specific grant, you will likely engage in due diligence about the financial health of the organization to assess stability and ability to carry out the program for which you are considering support. Similarly, it is crucial to assess the human health of the organization, to understand how well the staff is supported in executing their work, and what could be done better in this regard. 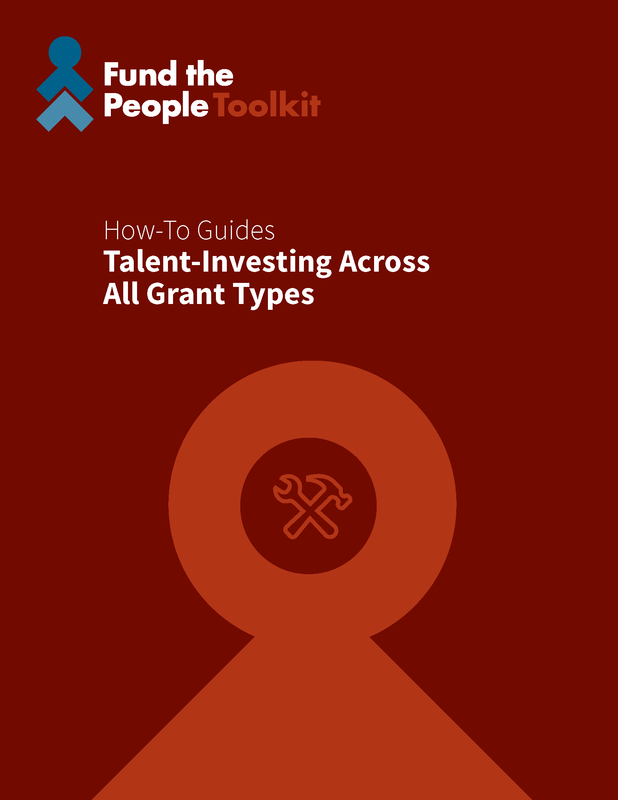 To learn more about this, see Guide to Investing in Grantee Talent. One simple way to structure a talent-investment into a project grant is to focus on the programmatic grant objectives that are agreed upon by the grantmaker and grantee. Ask yourself: could adding a talent-focused objective support the substantive objectives? How could you help to empower or improve the staff’s ability to achieve the best program results? Staff costs are often the most expensive cost within any given program. Depending on the specific services in question, the “direct costs” of a program (supplies, printing, space rental, food) may be extremely small compared to the time (i.e. compensation) of the staff involved. As part of the objectives, activities and line items in your grant, you can empower the program staff to sharpen skills and knowledge through professional development directly related to the program work the grant supports. This could mean paying for staff to attend a training, conference, access coaching, taking an online course, or other method of honing their understanding of best practices for a program like theirs. This can be mutually beneficial: it will likely enhance the ability of staff to execute high-quality programming. It is also likely to increase staff morale, since professional development is viewed as a major benefit in nonprofit work, your concrete support of the staff in exchange for their work will be duly-noted and appreciated. The nonprofit staff will perceive that your foundation cares not just about their work, but about the people doing the work – this is likely to increase levels of positive perception and trust, which can create a more productive relationship between you and your grantee. Important note: It’s vital to have realistic expectations from this approach. Enabling nonprofit professionals to attend conferences and trainings on its own (without pairing this approach with other more structural and ongoing talent-investments) has a useful but limited impact on organizational effectiveness. By making talent-investments within the context of program grants, and focusing on professional development, you are making a relatively modest commitment to staff development, and in turn you should expect modest results. Professional Development Funds: Allocating grant dollars to establish or bolster a pot of professional development funds available to program staff or all staff in the organization is another type of financial reward. This is different from directly paying for or providing specific types of professional development activities. It is more about building up the budget to which staff have access for their own development, now and in the future. This is indeed a critical resource, and can help seed a commitment to integrating professional development into the organizational and/or program budgets. When you fund a new project or program into creation, the staff at the organization is taking on a new scope of work. It is more than likely that this work was not in their job description when they were hired. Research from Nonprofit HR has found that around half of nonprofits organizations do not hire new staff to support new programs 1. It is likely that the existing staff is expected to take on the new responsibility with neither an increase in salary, nor a more senior title, or other benefits. It is important, therefore, to consider how your grant can offset these challenges and minimize the likelihood of staff overwork and burnout, which can hurt the quality of program implementation and sustainability. Increase Staff Support: Engage administrative support staff, skilled graduate students, or well-paid interns to support the program staff in taking on this new line of work, and/or to take responsibility for some of the work the program staff previously did, making room for them to work on the new program. Overall, designating portions of program grants for staff development can be an important and empowering opportunity. Ear marking at least five to 10 percent of grants for talent-related investment can help organizations juggling many program-focused investments to get acquainted with the practice. As more funders adopt this approach, nonprofits can amass the financial resources needed to drive excellence through staff development. Vacation: Support “special vacations” annually or upon completion of grant-funded work. Funds can pay for time off as well as providing staff with resources to pay for flights and hotels. Such an opportunity is truly a unique gift, and can help to revitalize staff upon return to their work. Retreats: Enable the program team or individual leaders to get away from the office in a true retreat environment with access to great food and relaxing activities (swimming, massage, yoga, and other pampering!) This can either include work-planning components or simply be an opportunity to get away and renew the spirit, mind, and body to come back to program work fresh and energized. Sabbaticals: Structuring a sabbatical for staff enables them to write, study, reflect, brainstorm, and plan for their program work. This can truly help infuse programs with new ideas and information. It also enables the person taking sabbatical an opportunity to delegate, and those who stay behind to step-up and take on new levels of leadership. If your primary mode of grantmaking is providing general support, you may wonder how you can bake in talent-investments. Indeed, you may feel that general support is so flexible that grantees can and should already be using it for staff development. That is true in theory. But our conversations in the field indicate that many nonprofits use general support to back-fill budget gaps in programs and other essential components. This practice is common when payments of government contracts are delayed, cash flow from other funders is late or interrupted, or other dynamics combine to disrupt the highly-complex challenge of managing the finances of a nonprofit. Back-filling, even if it is covering staff compensation, prohibits meaningful investments in staff development. It keeps your organizations in the game, but does not let your grantees take their team to the next level. Here are several methods you might try to ensure that talent-investments will be incorporated into general support. The most important thing general-support funders can do is ask questions about staffing. Listen carefully and with empathy to the responses and be clear about how important talent-investment is to the foundation. You can let the grantee know that you and the foundation value and respect the dignity, hard work and well-being of the nonprofit’s staff. You can strongly and explicitly encourage them (in conversation and in writing) to use unrestricted dollars to invest in staff development. Within this empowered environment, the management can have the political space to talk to their board and staff about their needs as well as the opportunity to deploy investments from your foundation and others. Providing an organization with staff-development resources is priceless, and no restrictions are necessary. Every general support funder has their own guidelines for the specific definition and parameters of unrestricted funding. Some, for example, ask for a grant budget, while others do not. Some list overall organizational goals and objectives in a grant agreement as a way of framing the goals of the grant, and assess the success of the grant based on these intentions while others do not. In the context of general support, if you capture organizational goals and objectives in grant proposals, grant agreements and/or grant reports, then you may find it beneficial to further infuse general support grants with the spirit of talent-investment by talking with grantees about their staff development needs, encouraging them to include overall staff development objective(s) alongside other organizational objectives in their proposal. In this way, both parties know that the success of the grant and the organizational will be assessed in a manner that includes their self-identified staff development efforts. If there are specific resources that you want to allocate to talent-investments for grantees, it may be worth establishing a pot of funds to provide specific infusions of talent supports on top of general support. This enables the flexibility and responsiveness of general support combined with the intentionality and proactive approach to staff development. The staff doesn’t have to choose between their own development and other pressing budget priorities. They do not lose the critical unrestricted funds, but they cannot as easily fall back into the pattern of suppressing their own growth for the sake of the organization’s programs. Traditionally, foundation investments in grantee talent are made in the context of capacity-building grants and activities. However, too often leadership and staff development are listed as one item in a long list of capacity bullet points, as if they are equal in weight and importance as technology, physical plant, strategic plans, etc. We assert that robust staff development and people systems are prerequisites for most, if not all, other organizational capacities. As a capacity-building funder, consider the role of talent-investment within your broader capacity-building efforts. Where does it sit as a priority? How do other capacities build upon staff development? How can talent-investments help to establish a bedrock upon which other organizational capacity can be layered? We will not go into further detail here on the type of staff investments that can be made as part of capacity-building, as it is an endless list. Instead, we encourage you to check out our Thinking Through Choices in Talent- Investment for more in this regard. Fund the People is the national campaign to maximize investment in the nonprofit workforce. To achieve this goal, we make the case, equip for action, and build a movement to change the attitudes and behaviors of funders, fundraising nonprofits, and the intermediaries that support them. There is a long-standing, sector-wide deficit of investment in the nonprofit workforce. Nonprofit professionals work in environments typified by high burnout and stretched resources. So there is a real demand for equitable salaries and benefits, more and better professional development, improved human resources functions, and healthy organizational culture. Together, we can address these challenges by reshaping existing resources to prioritize nonprofit people as the central asset of nonprofit performance. Now more than ever, we can ensure that America’s civic leadership is diverse, well-supported, high-performing, and sustainable for the long haul. Launched in 2014 and headquartered in Beacon, NY, Fund the People (originally known as Talent Philanthropy Project) is a project of Community Partners. Our work is informed by an Advisory Council of diverse leaders and a team of skilled staff and consultants, and is supported by a coalition of regional and national foundations. Rusty Stahl is President and CEO of Fund the People, which he founded in 2014. He is also a Visiting Fellow at New York University’s Wagner Graduate School of Public Service. Connect with him on Twitter at @fundthepeople. Financial support for Fund the People’s Toolkit has been generously provided by American Express, Annie E. Casey Foundation, David and Lucile Packard Foundation, Durfee Foundation, Ford Foundation, Kresge Foundation, Robert Sterling Clark Foundation and W.K. Kellogg Foundation. Fund the People is appreciative of the following individuals for reviewing, editing, and providing helpful input on content throughout the Fund the People Toolkit: Jessica Bearman, Yolanda Caldera- Durant, Biz Gormley, Rebecca Schumer, Mark Sedway, and Rusty Stahl. We’re also grateful to the following Fund the People Advisory Council members who provided informative feedback and guidance on the Toolkit: Caroline Altman-Smith, Kelly Brown, Cynthia Chavez, Gali Cooks, Amber Cruz-Mohring, Ann Goggins- Gregory, Lupita Gonzalez, Sonia Ospina, Pratichi Shah, James Shepard, and Sean Thomas-Breitfeld.